Interest Rates on online bookings upto 8.75% p.a. and offline up to 8.50% p.a. Mumbai, June 18, 2018: Mahindra Finance, a leading Non-Banking Finance Company (NBFC) focused on rural and semi-urban markets, has announced an upward revision of interest rates on its term deposits. In order to encourage paperless and depositor friendly transactions, Mahindra Finance is offering additional 25 basis points (bps) or 0.25 percent interest on online deposits. Customers will nowget a fixed deposit rate of upto 8.75% p.a.for online deposits and upto 8.50% p.a. for offline deposits. 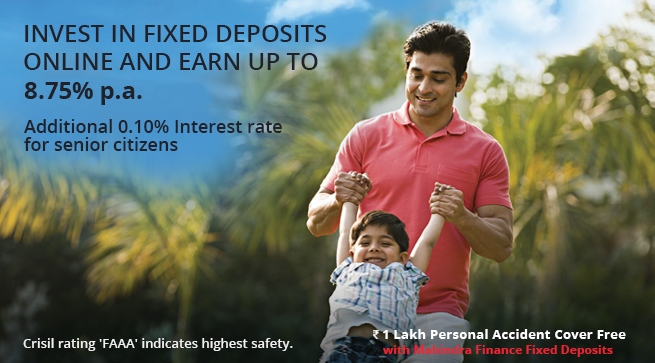 Investors can access this facility online by visitinghttps://fixeddeposit.mahindrafinance.com. Mahindra Finance is the only Non-Banking Financial Company from India to be listed on Dow Jones Sustainability Index in the Emerging Market Category. Mahindra Finance has been ranked among the Top 15 of India's Best Workplaces in the BFSI segment, 2018 by Great Place to Work® Institute India. We have also been recognized as Aon Best Employer 2017 and Best BFSI Brands 2018 by The Economic Times.